Carol D. Eustis Center for Health Professions groundbreaking ceremony. About a decade ago, CCBC began to make its way through a $300 million capital agenda and we have been moving full steam ahead ever since. Our campuses are 60 years old. Sixty is not such a bad age for a person, but it is a terrible age for a building! Now we are in the process of steadily renovating, restoring and replacing campus buildings, built decades ago, with state-of-the-art facilities. Campuses are not just piles of bricks and mortar. They are made up of people who collaborate to build positive relationships to accomplish great things for the students in our care. At the top of the list of such CCBC heroes is Carol Diane Eustis, Dean Emeritus of CCBC’s School of Health Professions, who passed away in 2015. To celebrate her life and career, CCBC’s Board of Trustees approved our request to name the college’s new Health Careers building in her honor. It was Dean Eustis’ vision, tenacity, spirit, talent, skill and sheer dogged competitiveness that built CCBC’s School of Health Professions into the largest provider of undergraduate Health Care education in the state. Size is surely one measure of success, quality is another! CCBC’s Health Programs are not the “best in the state” because we at CCBC say so; they are “the best” because every medical facility in our region says so … and competes to hire our graduates. 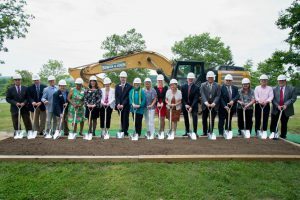 Recently we symbolically plunged symbolic spades into the ground to begin the process that will turn a large mound of dirt on the CCBC Essex campus into the 120,000-square-foot Carol D. Eustis Center for Health Professions. This dynamic state-of-the art building, scheduled for completion in fall 2020, will serve as a fitting tribute to the work of an amazing colleague who left us far too soon. A facility—new or old—is just a collection of bricks and mortar, paint and tile, an empty shell, until it is touched by the spirit of the people who will fill it with learning, laughter, joy and rigor. This particular building will represent the vision of one incredible academic leader whose name will now grace the center of learning she dreamed of. Dr. Carol Eustis’ legacy of quality health programming will come alive in its gleaming high-tech classrooms and laboratories, and most significantly in the realized potential of the students who study, learn and grow there.